The list was not published. to membership in the PLO. says it honors the 1975 U.S.
or negotiate with the PLO. protestors made her speech inaudible. to the easy-listening tunes of Jerry Mann. and the volunteers. "Everybody makes you feel at home,"
in two years, including classes in painting and ceramics. geriatric homes can't hold a candle to Morse. Gackenheimer with a hand-crocheted afghan. "Mr.
volunteers work closely with the residents. have loved every day; I never miss a day." has helped comfort family members. success to Micki Ross, director of volunteers, whom Mrs.
Spiegel described as "second to none." the Center during the last two years. Soviet Ambassador to the U.S.
in Haifa in recent weeks. County Road (one block north of Royal Palm Way). ly New Thrift Shop a special place in our community. our Jewish Home for the Aged of Palm Beach County. Please call 471-5111, Ext. 179 for further information. that "if it weren't for the U.S.
the State of Israel with a group of concerned local citizens. that only 8 percent of the U.S.
"We have to flex our muscle. raising money in an off-year,"
make it incumbent on the U.S.
to continue aid to Israel. was run out of Beirut in 1982.
port might not be significant. judges of who is a Jew. other civilized nations ever since. that this time they were prepared. went into wild chants of "death to Israel,"
Doron was attempting to stay. head on. They were not. States and Puerto Rico, Mrs.
ween the Arabs and Israel. an improvised tour of Jerusalem. i-ubTMASTER: Sjnd address changes to Tha Jewish Floridian. E'xm h Bionde. VmtptLi^T. ^oe,"on >' plm Beach County. Inc Officer. Pr..dent. man. Shirley Greenberg and Janet Rosenberg. munity room in the Cross County Mall on Thursday, Aug.
22, at 12 noon. Space is limited so reserve your table early. by William Rubin, Program Assistant. At their recent gala donor luncheon. Mayor Malcolm H.
Jeanne Finkelstein with a key to the city. 12 DAYS/11 NIGHTS S^fAM **"
W6. sept23 sraDI)0S & Holidays. Out of Date County C. M^jSSooff Own*-*."" 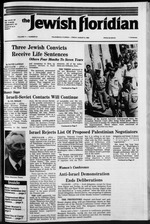 that applied even to the U.S.
Friday August 2, 1985/The Jewish Floridian. of Palm Beach County Page 5..
businesses and for the N.Y.
2 Defctous Kosher Meats Doty ___ ..
couraged to get involved now. part of a total effort." "The Mood of the Country,"
potatoes, peas and carrots . Mengele, the notorious Auschwitz death camp doctor. Dr. and Mrs. Jerome J.
ta, daughter of Mr. and Mrs.
Kodish of West Palm Beach. la replica of the Western Wall. *king dough for pita bread wu a favorite activity. will be served. Donation is $1. Sunrise Ave., Palm Beach for their "Happy Hour." Messina. Call Phyllis for directions. Terrie, 689-7700, to insure enough food for all. rots, fresh apple, rye bread. YEAR ROUND WAY Of UFEI SO PIANY ARE DOING IT NOW! to ask. Everyone is welcome. I are free on bail. ds to the Supreme Court. spiracy and the bus plot. bombing of the Arab buses. 2550 OKEECHOBEE BLVD.. W PALM BEACH. over 300 people in attendance. promote endowment development for three participating Federations. Guardian Plan Chapel. West Palm Beach. dian Plan Chapel. West Palm Beach. thwood Funeral Home, West Palm Beach. Beach. Riverside Guardian Plan Chapel. Marjem J., 91, of Royal Palm Beach. **-*?" *! 999 "O' *o*. BEACHES: Services held Friday 8:15 p.m. and Saturday*? TEMPLE BETH DAVID: 4657 Hood Road, Palm Beach Gardens! 33407. Phone 833-0339. Cantor Elaine Shapiro. Sabbath services! vices, Friday, Aug. 2 at 8 p.m.
feeling of warmth and family. evening will conclude at 8 p.m.
be left out. Call Bessie. party planned for that date. - Cemetery planning and counseling. - Serving the Jewish Community for 93 years. FunralDimcton Sine* 1SW A DMslon of OuH^cmcm* Inc.
Chapels in Rockville Centre, LIWoodbury, LI. at St. Rita's this year. ^^ Aug. 2 7:50 p.m.
p0^Q Aug. 9 7:45 p.m.
& State Sales Tax, Perpetual Care. memorial park and funeral chapel at one convenient location. 7 minutes west of 1-95 via Lake Park Road Exit. any reason why the U.S.
was long delayed. His plans this month. sarily mean he's the doctor for you. name to base your decision on. at JFK Hospital Call 433-3654.